The aim of this work package is to develop a portal to present the workflow outputs of the thematic work packages (WP4,5,6) and to automate the transformation of Earth Observations data into indicators using Essential Variables. Through the different tasks of this WP, we have started developing several components to build this web-based platform. The first component will use tools provided by the GEOSS platform to implement a subset of the GEOSS portal (http://www.geoportal.org) with restricted search and access to only Essential Variables. 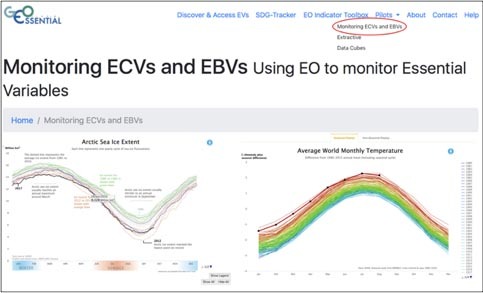 Thanks to the GEOSS mirror capability we will be able to provide a single-entry point to connect, discover, and access relevant data sources for Essential Variables on Climate, Biodiversity, Water, and other themes. The second component that will be one of the core functionality, is the so-called Virtual Laboratory developed by CNR. GEOEssential project partners are in need of and generate a heterogeneity of resource types such as: satellite data, in-situ data, services, analysis and modelling tools, processing algorithms, models/workflows and models results. These resources need to be discoverable and accessible to all project partners as inputs for ecosystems and ecosystem services study, as well as to various categories of external users. To address these requirements, an interoperability framework has been defined for the GEOEssential Virtual Laboratory Platform (VLab) that provides a web service-based access to the resources. This means that the heterogeneous resources provided by the VLab can be discovered and accessed by users in a harmonized way through multiple interfaces supporting interoperable machine-to-machine communication over the Internet. This supposes a mediation among the heterogeneous standards and descriptions of resources, which is the role of an intermediary layer between the data and the users that is called a “broker”. The broker “translates” the various formats of the data/metadata/models into homogeneous ones that are in turn exposed to users. Resources producers therefore do not need to make extra effort to use a common standard, as this is the role of the broker to perform this translation. In March, a team of the University of Geneva spent an entire week at CNR to learn more on the VLab technology and has prepared a first demonstration workflow using the VLab to generate the SDG indicator 15.1.2 “Proportion of important sites for terrestrial and freshwater biodiversity that are covered by protected areas, by ecosystem”. The full workflow implementation and use will be demonstrated during our forthcoming workshop in Palma at the end of April. Within WP5, a second workflow is under preparation concerning the impact of either active or abandoned/decommissioned mines on forest loss and fragmentation. All these workflows will be embedded in narratives (or storylines) to contextualize the overall workflow with a special attention on environmental management and related policies. Such approach will help to link the developed workflow to real-life problems. In the coming months, we will also investigate how best to provide visualization and dashboard functionalities such as storymaps and interactive widgets within the GEOEssential platform. Currently, a very early draft mock-up is available at: https://geoessential.unepgrid.ch/dashboard/ and will evolve along the entire duration of the project (Figure 1).